Dimensions 7' 9" x 7' 7" x 3' 2"
Filter Size 325 sq. ft. 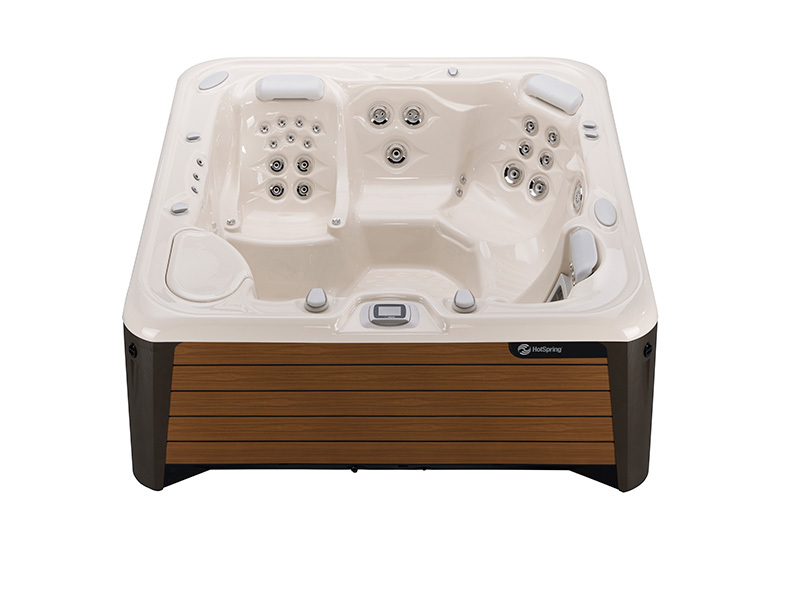 The Envoy NXT is a great choice if you desire a large lounge spa with high-performance features, powerful full-body massage, and a look that will enhance your outdoor space. 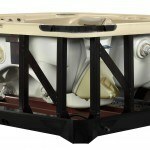 As a part of the Highlife Collection, the Envoy NXT also offers the very best in energy-efficiency, and is available with the ACE salt water system, all to provide you with The Absolute Best Hot Tub Ownership Experience®. In addition to the unparalleled performance you can count on from the Highlife Collection, the NXT models offer these value-added and innovative upgrades: Architectural Molded Corners, Beautiful Exterior Lighting, Large On/Ready Indicator Lights, Polymeric Sub-Structure, and Polymeric Base Pan. 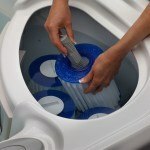 HydroStream jets soothe tired muscles with constant streams of flowing water that relieve tension and quickly soothe away tension. Control the direction of this Precision Jet to target problem areas. Focusing attention on your back, neck, calves and wrists, the Precision jet's directional and rotary nozzles perform like the fingers of a professional masseuse. The Rotary Hydromassage jet performs like the fingers of a professional masseuse, with rotating nozzles that soothe your back, neck, calves and wrists Powerful not punishing, these jets have a directional nozzle with a flow-enhancing design for maximum performance. 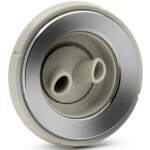 The interchangeable dual-port rotary nozzle creates a V-shaped pattern of water for a pulsating massage. 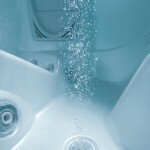 The unique SoothingStream jets have twelve openings to create a powerful stream that gently relieves tension in your shoulders and upper back. 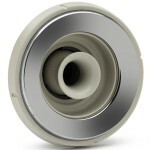 Aching lower back pain needs the extra power of a JetStream jet. 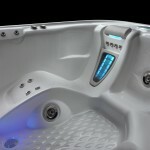 An invigorating, directional whirlpool jet far more powerful than a Hydromassage jet offering fast relief. 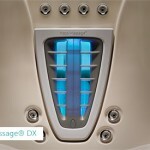 Contains the Moto Massage DX jet, precision calf jets and two hydromassage foot jets. 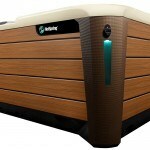 Hot Spring Spas revolutionized spa the industry with this one-of-a-kind moving jet that cascades up and down your back. The wireless remote control rests in the bartop dock, which also serves as charging station. A secondary resting station, molded into the Grandee and Envoy bartop, provides a convenient place to set the remote while relaxing in the spa. 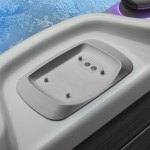 It is important to understand that the remote control is designed to withstand water immersion, but this high-tech device should not be left floating in the spa. 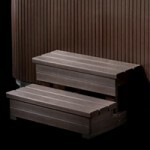 The remote control can be rotated in the dock for easy access to spa functions from inside or outside the spa. The dock also features jets and lights hard buttons that allow the owner to operate these important functions, even if the remote is not close at hand. 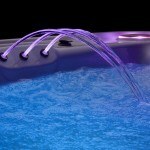 The elegant BellaFontana® water feature, enhanced by the rich colors of our Luminescence® Lighting system, adds to the ultimate enjoyment of your Hot Spring Spa experience. The perfect accent, a beveled acrylic plate displays spa status with large indicator lights incorporated into the Hot Spring logo. Beautiful Exterior Lighting Multi-color LED lights illuminate each corner. 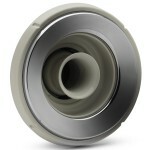 Independently controlled, these lights can be set to automatically turn on and off each evening. Immerse Yourself in Color... To further enhance and customize your spa experience, the Luminescence® LED spa lighting system lets you personalize the mood with multiple interior light color choices or cycle through all the colors. For added convenience the Highlife Collection Grandee and Envoy and all NXT models feature our unique wireless remote control with touchscreen technology. 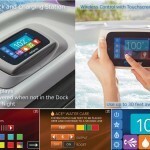 The most advanced control panel available, it features a full color screen with large icons and intuitive menus that make it easy to adjust spa functions. Remove the remote from the bartop charging dock and carry into the spa to adjust jets, lighting and even music from your favorite seat, then set the panel in the secondary bartop resting station while you relax. COME IN AND SEE IT FOR YOURSELF! 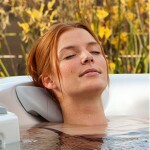 The wireless remote control allows you to adjust spa settings from anywhere inside the spa. The remote can also be used up to 30 feet outside the spa – making this a great option to control lighting and music when entertaining in the backyard. Please note that the remote control requires a direct line of sight to the bartop docking station in order to ensure consistent communication. The signal will not transmit through objects or water. 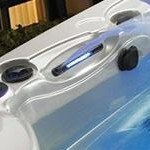 Leave your music source inside, while listening to it outside in your spa. 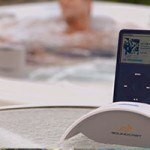 With our In-Home Wireless Dock, you can connect with virtually any audio source you choose: iPod®, iPhone®, MP3 player, satellite/AM/FM radio, CD/DVD player to instantly transmit to your spa. 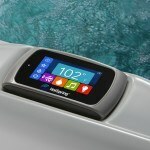 Change tracks, adjust volume and play or pause through the spa's main control panel using your Apple® device. For maximum entertainment, add the OPTIONAL excitement of a Wireless TV to the Wireless Sound System. 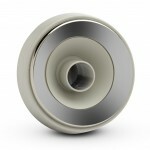 Transmit your favorite show from your home TV wirelessly, whether it’s cable, DVD, or satellite. There’s no need to run cable to your spa nor place a DVD player outside. 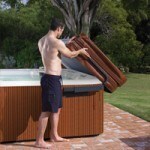 The 17” widescreen LCD TV that attaches to your spa cabinet is waterproof and temperature resistant. 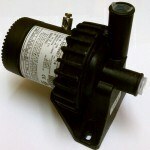 It comes with a mounting bracket that rotates 350? so you can enjoy the TV from anywhere in your backyard. 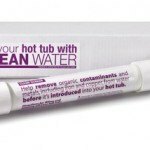 The Clean Screen pre-filter prevents organic contaminants, tannins, copper, iron and other metals from entering your spa water. 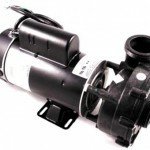 It's simple to use – just attach it to a garden hose, fill your spa and enjoy fresh, clean water. 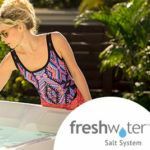 The FreshWater Ag+ continuous silver ion purifier helps to reduce the need for chlorine by introducing silver ions into the spa water that inhibit bacterial growth. Insert the cartridge into the filter of your Hot Spring spa, and the silver ions are released automatically - there's no chance of under- or overdosing. 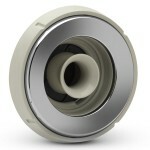 It's virtually maintenance-free - simply replace the cartridge every 3 months. To soften hard water without chemical additives, use the Vanishing Act calcium remover. 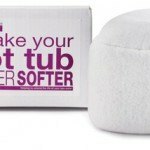 Softer water leaves your skin feeling silkier, and helps protect your hot tub from the damaging effects of hard water. The internal polymeric frame provides structural support and makes it possible to achieve the distinctive floating effect. It also helps preserve fit and finish over time. 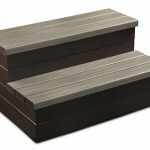 These spa steps do more than provide a safe hot tub entry and exit. 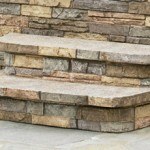 Providing the largest surface area of all the step options, the Spastone Steps are steeped in style. 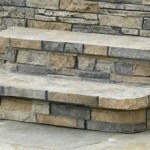 Their rich texture, color range and grout less stacked stone appearance are naturally appealing. Lean back, relax and fully experience your spa's soothing sensory performance with this convenient, comfortable and portable spa pillow. This handrail's base plate slips securely under the spa cabinet for stability, and swings in and out of your spa — making it easy to reach when entering or exiting the spa. 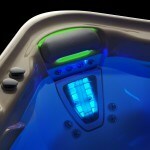 It also features a battery powered LED light for added convenience and safety at night. 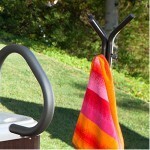 Keep your towel within reach with this easy-to-assemble towel tree, constructed from powder aluminum with a bronze finish that makes a stylish and convenient addition to your backyard. 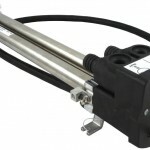 Similar in design to the CoverCradle, this lifter uses a single pneumatic gas spring and allows for smooth operation. Requires 24" clearance. 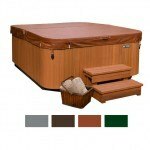 Hot Spring Spas pioneered the first rigid, vinyl hot tub cover, creating a higher standard for energy efficiency. 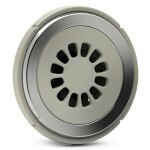 The exclusive "shoe" in the cover hinge creates a tight seal that locks in heat. The 2.0 lb. foam core density increases the ability to retain heat. 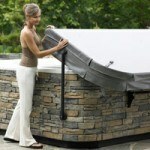 Only a Hot Spring® spa cover is designed specifically for your Hot Spring spa. When it comes time for a replacement, never settle for an imitation. DURABLE DESIGN Hot Spring covers are outfitted with exclusive, sturdy brackets for strong support and easy installation of our exclusive cover lifters. Each cover is made with double-stitched vinyl for a durable hinge and extra strong padded handles for long lasting performance. 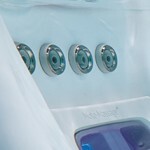 There are 24 internal stress points reinforced in each spa cover, including aluminum reinforcement for maximum strength and minimum weight. Available in Slate, Chocolate, Caramel, and Evergreen. It's easy to remove your cover with this economical cover lifter. Requires 14" clearance. 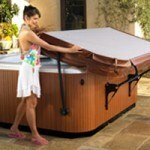 This system lifts the cover up over the spa bar top. 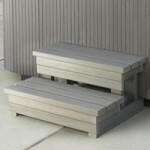 It is ideal for limited clearance applications such as decks and gazebos. Requires only 7" clearance.